Virtual reality (VR) is the future of digital entertainment. VR can provide an immersive experience with extreme details, but you will need a reliable graphics card that can handle the demands of high framerates and impressive visuals. What kind of hardware will allow you to enjoy the next generation of virtual reality gaming? I aim to help you answer this question by showing you some of the best VR ready graphics cards for 2019. What Does a Graphic Card Do? A graphics card, also known as a graphics processing unit (GPU), is a component in your computer that is used to process and display graphical data as images. In general, more powerful graphics cards are able to process and display a larger amount of visual details than the default video cards found in your standard desktop PC. The graphics card improves the performance of your system in several ways. Since the graphics adapter takes control of graphics processing roles, your rig’s RAM is free for other tasks. These newly available processing capabilities allow your system to run programs more efficiently when video processing tools are needed. This means that your basic video card and CPU can be used to operate background processes while the GPU performs the heavy-lifting of graphics data processing and image rendering. After installing a high-end graphics card to your rig, you may notice higher frame rates and better images when you opt to play games with demanding video settings. The enhanced graphics processing capabilities of your system upgraded with a good graphics card may allow you to enjoy the extra features commonly found in the video settings menu of a AAA game. For example, if you play The Witcher 3: Wild Hunt, you can use a powerful graphics card to improve the world with dynamic shadows, reflections, water fidelity, light fracturing, and nuanced features like grass. The volume of assets like NPCs and in-world objects can also be increased without sacrificing the framerate. In open-world games like Skyrim VR, the immersive experience depends on your ability to perceive depth and the way the environment changes relative to your position in the game. A VR ready graphics card can improve this experience by increasing draw distances and rendering speeds. Consider the last time you played an open-world game like Skyrim or Fallout 4 on a rig that could not quite handle the graphics demands. You may have noticed that characters and visuals do not render properly if you move across the world too quickly. Skyrim VR players often notice that the peaks of distant mountains appear jagged and unnatural due to their poor rendering speeds. A good GPU can help solve this problem to keep you from losing your sense of immersion. What to Look for in a VR Ready Graphics Card? Now that we have discussed the perks of having a top-quality GPU for VR gaming, let’s talk about what types of specs you should keep an eye open for. The most powerful graphics cards on the market can be quite taxing on your rig if you do not have a proper cooling system. Thermal design power (TDP) is measured in watts, and it is listed on the graphics card itself for new models. You can check the thermal design power rating to learn how operation temperature and energy consumption of a GPU might be handled by your cooling unit. If the graphics card you are interested has a high TDP value, you may need to consider upgrading your coolers with additional fans and other hardware tweaks. When comparing otherwise identical GPUs, select the option the lower TDP value. The power consumption value tells us how many watts the GPU consumes. Some manufacturers also provide a recommended power supply unit capacity, so check your rig’s current specs against both the power consumption value and the recommended power supply unit capacity. This information will tell you if you need to make power supply unit upgrades or opt for a graphics card with lower power consumption requirements. Graphics memory is not nearly as important as GPU marketers would have us believe, but it is still a spec that we should consider when choosing a graphics card. Graphics memory is used to load textures and to hold rendering assets. It is also used to maintain frame and depth buffers. Graphics memory is particularly important if you use the anti-aliasing options available in most games. Anti-aliasing is a technique that smooths jagged edges that develop out of curvatures and angles. Anti-aliasing tends to make in-game architecture and facial appearances more realistic. When anti-aliasing settings are on, your GPU will use a significant amount of memory. 1 GB is usually sufficient for most VR games, so most high-quality graphics cards on the market have suitable memory specs (Tom’s Hardware). The memory bit rate is often listed as the memory bus value. The memory bus value is a measure of how much data the GPU can access from memory at any moment. Higher memory bit rates generally lead to faster processes and higher framerates. There are two types of clock speeds that you should keep an eye out for: memory clock speed and GPU core clock speed. The memory clock speed is measure of how quickly the graphic card transfers data after it receives an instruction. The GPU core clock speed is a measure of how many instructions the graphics card can process per second. The GPU core clock is one of the most important determinants of performance. If you are looking to play graphically intensive VR games, look for GPUs with high core clock speeds. Large clock speeds are ideal, but do not be fooled by the effective clock speeds listed on newer cards. The actual clock speed is the only value in this category that matters for product comparison purposes. You will likely purchase a Nvidia or AMD graphics card. Look for options that have a high quantity of CUDA core units and shaders for Nvidia and AMD, respectively. While their names differ, CUDA cores and shaders are both used to render images. Higher core and shader values imply better images and more realism. Before you purchase a GPU, you should check to see if it will work for your system. Will the card fit in your case? Are there enough display ports to support your monitors? Are there any special compatibility requirements that you need to satisfy? Answering these questions in advance will save you from the troubles of lost time and buyer’s remorse. 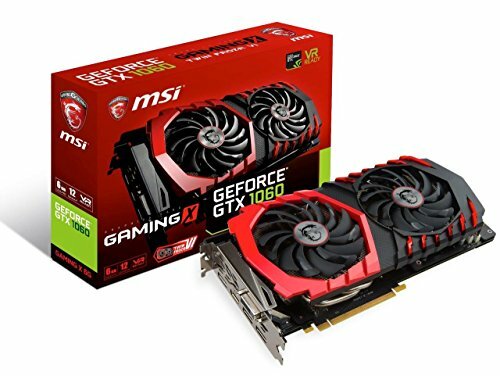 The MSI Gaming GeForce GTX 1060 Gaming X 6G graphics card is a good option if you are looking for a good specs and a low price relative to other VR ready GPUs on the market. Fans of this GPU for VR appreciate excellent performance at medium-high settings. 35 to 60 fps is the norm for the most graphically intensive AAA titles when using medium-high settings. Cooling is also effective due to great power economy and a low TDP rating. It uses 120 watts. The recommended power supply should be able to handle 400 watts. Some users of this GPU are critical of the fan settings. They turn on only at high temperatures, and their speeds cannot be tweaked without a third-party utility tool. The GPU has 3 display ports, 1 HDMI port, and 1 DVI-D port. It uses a single 8-pin connector. Like other Nvidia graphics cards, the MSI Gaming GeForce GTX 1060 Gaming X 6G uses the PCI Express interface. The clock speeds and CUDA core values are low when compared to the specs of high-end GPUs. The RAM is sufficient for most VR purposes. Overall, this graphics card is a suitable option for people on a budget. You will be able to enjoy most VR games, but you will need to avoid the maximum settings. 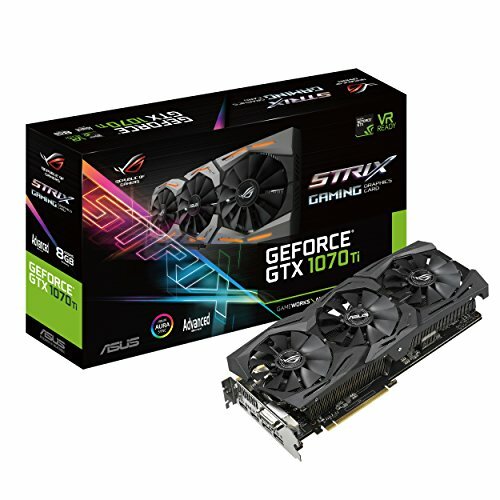 The Asus ROG Strix GeForce GTX 1070 Ti 8GB is not one of the most extensive graphics cards, but it has the specs of high-end hardware. You might like this product for its high RAM and decent clock speeds. People who have purchased this product are often fans of the high number of CUDA core units. At 2,432 CUDA cores, images are rendered with high levels of detail. This GPU runs very quiet, and temperatures remain low throughout use due to high-pressure fans and new heat dissipation technology. This graphics card supports up to 3 monitors. It has 2 display ports, 2 HDMI ports, and a DVI-D port. It relies on an 8-pin connector. Unfortunately, you might need a larger case for your rig; the graphics card is very large at 12 x 2.2 x 8.7 inches. The MSI Gaming GeForce GTX 1070 8GB is a big step up from its 1060 cousin. It uses the recently overhauled Nvidia Pascal architecture to provide impressive clock speeds. It has a memory clock speed of 10108 MHz. It offers a core clock speed of 1683 MHz when gaming. At 8 GB, this GPU has more than enough RAM for virtual reality gaming. This graphics card has 2,560 CUDA core units. While this VR graphics card has good specs, users have complained about high temperatures due to fan issues. You may need to consider tweaking the default fans or checking the thermal paste if your system indicates heat problems. This VR GPU requires 150 watts, and you will need a 500-watt power supply unit. To reduce wear and energy, the GPU turns off when video processing is unnecessary. You may appreciate the high number of ports. This GPU has 3 display ports, 1 HDMI port, and 1 DVI-D port. It can support up to 4 displays. It uses an 8-pin connector. 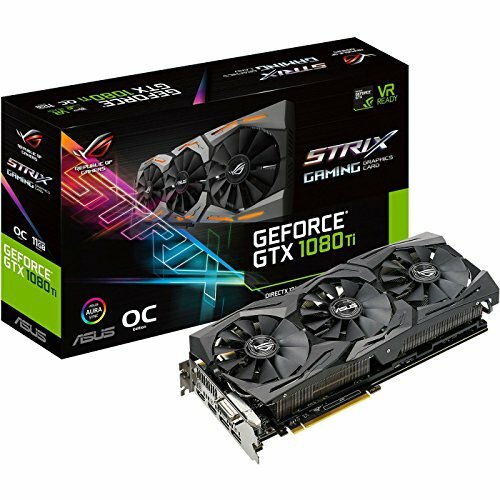 The ASUS ROG Strix GTX 1080 Ti 11G is a high-end graphics card for virtual reality gaming, so it offers great specs at a steep price. While this option is likely not suitable for casual gamers or people on a budget, you can expect great rendering speeds and high performance. 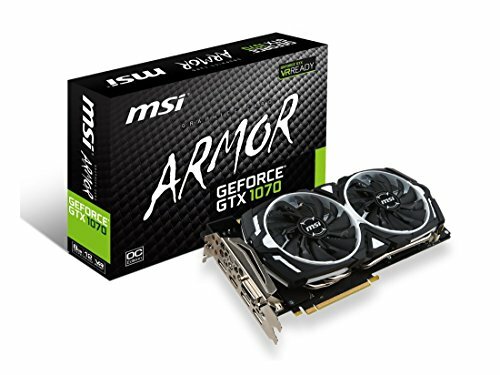 Some tests have shown that this GPU can be used to play For Honor at 185.4 FPS on extreme settings with a resolution of 1920 x 1080. This GPU has 11 GB of RAM, and it has above-average clock speeds. The base core clock speed is 1708 MHz. The memory clock speed is 11100 MHz. This graphics controller for VR gaming also has significant bandwidth at a memory bit rate of 352. The manufacturers list that it 3,584 CUDA core units. It supports a maximum resolution of 7680 x 4320. The wide bandwidth and large number of core units means that this GPU can quickly process detailed images. High performance capabilities often imply high temperatures during play. While this graphics accelerator card does become hot, it has multiple temperature sensors and a good cooling system. High-pressure fans consistently dissipate heat. This graphics card supports up to 4 displays and a virtual reality headset. It has a USB port, two HDMI ports, and two display ports. It uses two 8-pin connectors. The ASUS GeForce GTX 1060 6 GB is a budget option, but it offers great power economy and very high clock speeds for its price. Memory is sufficient at 6 GB of RAM. It has a core clock speed of 1809 MHz for good performance. The memory clock speed is 8008 MHz. Unfortunately, you may find that the memory bus lacks the width of its high-end counterparts; it is just 192 bits. Several users have not found this to be an issue for many games since they have used the GPU to support multiple 4K monitors displaying current generation games at maximum settings. Even without lag, images are not perfect; 1,280 CUDA core units cannot produce the same quality of images as a more expensive GPU. To prevent heat-related performance issues, this graphics card has two high-pressure fans. The GPU supports up to three displays. It has one DVI-D port, two HDMI ports, and two display ports. It uses one 6-pin connector. There are several great VR ready graphics cards for 2019. Based on specs alone, the ASUS ROG Strix GTX 1080 Ti 11GB is the clear winner. This GPU has more than enough RAM, great clock speeds, and a huge amount of CUDA cores. These specs combine to offer high framerates, short rendering times, and an excellent level of detail. None of the competitors in the list can compete against its CUDA core units or memory bus width. 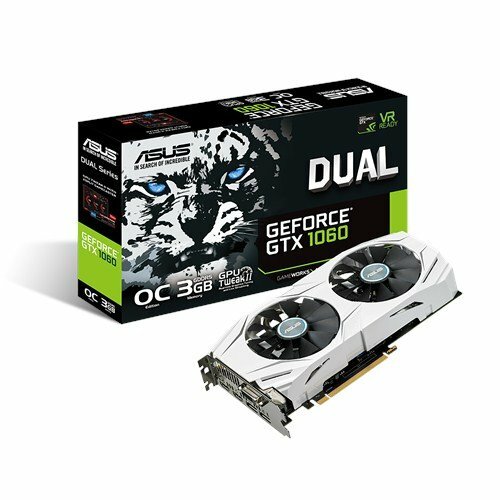 If you are an economical gamer who doesn’t want to sacrifice framerates, check out the ASUS GeForce GTX 1060 6 GB. While it doesn’t have nearly as many CUDA cores as competitors, it has sufficient RAM and fast clock speeds. This option is similar to the MSI Gaming GeForce GTX 1060 Gaming X 6G, but its superior clock speeds make it the budget winner.